Jakarta, March 7th 2014 - On Saturday, February 22th 2014, a groundbreaking ceremony was held for the new Hotel NEO Kebayoran, marking the commencement of the construction process for the new 105-room hotel. Taking the standard, minimalist budget hotel concept to an entirely new level, the new Hotel NEO Kebayoran will be the latest addition to the already famous NEO brand. Hotel NEO Kebayoran will merge authentic contemporary art and invigorating interior designs with high-end in-room facilities. It will come complete with upscale features and professional service, meeting the needs of the modern-day urban professional by offering a stylish yet affordable hotel alternative. Located in South Jakarta, the hotel is just 5 minutes to the Busway shelter and close by to high-end shopping malls like Gandaria City, Pondok Indah Mall and Senayan City & Plaza Senayan. Just 15 minutes away is the Cipulir Market, while Carrefour Express is located opposite to the hotel. 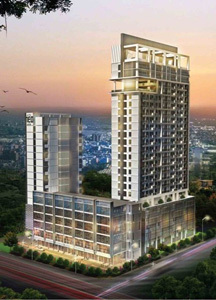 Hotel NEO Kebayoran will boast 105 rooms in two different categories. The hotel will also provide 4 meeting rooms, a coffee shop, a stylish lobby area and ample space for convenient parking. “We are always proud to commemorate the beginning of a new project, and this new build will be particularly exciting seeing as it is our flourishing NEO brand hitting the capital city once more. We are confident that Hotel NEO Kebayoran will live up to and surpass all expectations, and we promise that this latest branch will be as unique and contemporary as our other NEO hotels.” Said Norbert Vas, Vice President Sales & Marketing Archipelago International. Seen in the picture from left to right Mr. Norbert Vas as Vice President Sales & Marketing of Archipelago International, Mr. Tony Amin as President Commissioner of PT. Kebayoran Puspita, Mr. Anthony Putihrai as President Director of PT. Kebayoran Puspita (CEO Tamara Land), Mr. Omar Putihrai as Vice Chairman of Tamara Group, Mr. Bing Rahardjo as Commissioner of PT. Kebayoran Puspita, and Mr. Otto Putihrai as Director of PT. Kebayoran Puspita during the Ground Breaking Ceremony. Exterior of Hotel NEO Kebayoran – Jakarta.